The Dead Sea is drying up at a rate of 3.3 feet every year. It has already lost one-third of its size. That’s the observation made by EcoPeace Middle East, a consortium of leading environmental non-governmental organisations in the Middle East. Human actions are to be blamed for the shrinking of one of the saltiest water bodies located on the lowest point on our planet (1,388 feet below sea level). The Dead Sea region, surrounded by Israel, Jordan and the West Bank, is globally known for its unique geographical and biological features. Though there’s no wildlife in the Dead Sea itself, the region around it has endangered species like hyrax, ibex and leopard. The wetlands around the Sea are home to the indigenous "Dead Sea Sparrow". The region serves as an important resting and breeding site for millions of migratory birds crossing between Europe and Africa each year. A rich variety of minerals in the Dead Sea also makes it an attraction for millions of visitors who are keen on taking advantage of the therapeutic qualities of these minerals. During the World War I, some British engineers had marked the level of the Dead Sea on a rock. A century later, one has to climb down the rocks and trek for around two kilometres to reach the resorts lined up along the coastline. It’s another 2-km climb-down to reach the edge of the water. One of the primary reasons for rapid disappearance of the Dead Sea is the lack of water coming into it from the Jordan River and various tributaries. The river flows in from the north along the border between Jordan and Israel. During the 1960s, Jordan, Syria and Israel started diverting river water for irrigation in the arid regions. By now, more than 90 per cent of the water is being diverted. According to Gidon Bromberg, Israeli director of EcoPeace Middle East, "That demise of the Dead Sea is not global climate change— it is policies of the governments here in the region." Bromberg was certainly referring to construction of dams, storage reservoirs and pipelines. As a result, the sea level has fallen over 25 metres since early 21st century. The fall in the sea level has lowered water tables in surrounding areas, drying up micro ecosystems. On the western shores of the sea, 2,000 sinkholes have been identified. Israel, Jordan and the West Bank have plans to accelerate development around the Dead Sea, which will involve construction of new hotels and expansion of industry. According to experts, mineral extraction industries are causing a drop in water levels. The extraction activities of the mining companies—Dead Sea Works and the Arab Potash Company—are contributing to environmental instability of the region. In fact, the industrial solar evaporation ponds are responsible for 30-40 per cent of the total evaporation of Dead Sea waters. In order to attract more people to the Dead Sea region, the administrations are going on a development overdrive by proposing hotels along the central shorelines of the sea. Moreover, the construction of urban facilities, water parks and shopping malls will also put further pressures on the land and water resources. Untreated sewage into the Dead Sea is expected to increase from 15 million cubic metres (mcm) to 35-50 mcm. This hypersaline lake is not just getting shallower but also saltier. The EcoPeace had organised an event on November 21, 2016 wherein 26 swimmers from around the world braved the extremely salty waters to cross the Dead Sea from Jordan to Israel. 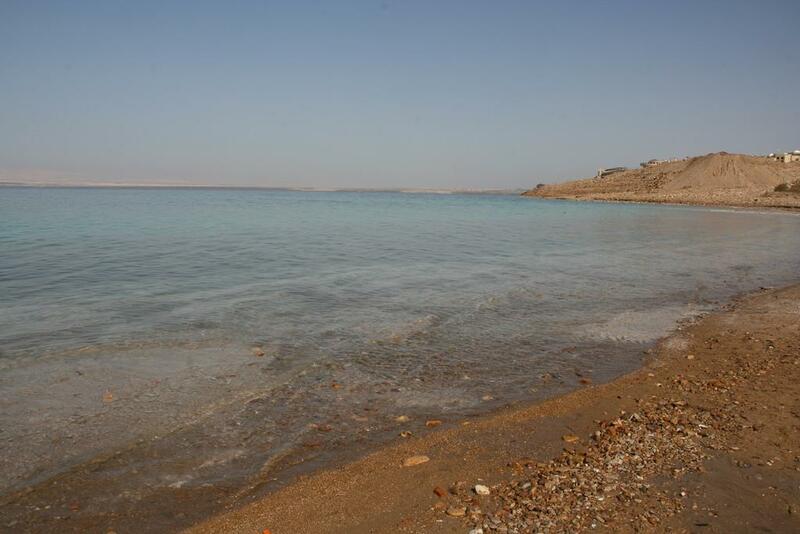 The event was aimed at raising awareness about the receding water levels of the Dead Sea. Since the sea has lost its sources of replenishment, it is not able to restore itself. Hence, lost water increases the relative salinity of the lake. In 2015, Israel and Jordan signed a US$900-million deal to build a 124-mile-long canal from the Red Sea to the Dead Sea. The waterway is expected to provide drinking water to the two countries and also pump water into the Dead Sea to arrest the decline in water levels. However, the project will take few years to get complete.